Not to say more about what happened in recent Sydney Test between Australia and India. All of you must be aware of it. Well I am going to represent my view only. For any sports or game, the most essential thing is sportsmanship. In this test, India played with its spirit for cricket. But what the Aussies did? They need victory, records, etc. What will they get from sportsmanship, spirit of cricket. Some people say it is a gentleman’s game. But now it is the game of money! They have very nice game plan always, inside the field and outside the field. But some of the game plans they do at both, such as biasing umpires, even 3rd umpire, match refry. If any player is playing good, they do something to break his concentration. As they know, they are not really that good, what is on the record book. If they did not success at this, complain that they have been racial abused by the player. This one is very good, no tension for next two or three matches. Many people abuse them(him) in their blog as M**Key. But I will not do that. Actually in world there are many words to abuse, specially for racial abuse. But why I need to do this. As always they name themselves with only one word! 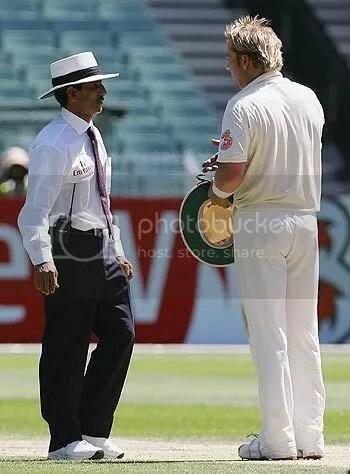 There any many cricket playing nations, but why everyone abuse (racial) to only Aussies? It’s because this is the part of game plan. And all the other teams are unaware of this type of game plan. Better to say all other team has no talent(?) to make this type of game plan. And the three vampires (oops… umpires) at SCG. They are done a great job! Wah! What to say about them? If any Indian appeals, then they have no finger, no eyes, no…., but when any Aussie appeals, then their fingers goes up. If they can confirm by asking any fielder, then why we need umpire in a match? But they must be very happy. As together, they become a part of a record (16 consecutive test wins). I don’t know what will happen next. But we need to take some action against the wrong. As we are spending our time and money on this game. And it is a question to our national team. Alleging one player means alleging the whole country. So, wake up and do something. I am talking about the last match between India vs. Australia. The umpires in the match both from ICC pannel and making silly mistakes. The first mistake was when Mongia hits the wicket and upils for a runout, the umpire Rauf is dening to give it to 3rd umpire. When he gives it to 3rd umpire it turn to run out. When the ball hits to the shoulder of Sachin the other umpire says it’s an OUT. It is good the he understood his mistake and changed the decision. When dhoni was given out, it was a no ball. When Harbhajan was given out, it was not touched his bat. These wrong decision turns the match a loss for India. Why pay money to the umpires? To give wrong decesions? Strong action should be taken against him.